The Ryder Cup is Fake Sport. A third flop renewal in a row lays bare the event's essential unreality. It is becoming a cod and a con job where a molehill of meaning is dwarfed by a mountain of hype. If the Ryder Cup is not competitive it is nothing. There's no denying the hugely exciting nature of a close final day, with its unlikely comebacks, sudden momentum switches and nerve-wracking finales. But there haven't been any days like this lately. This year's model was strikingly similar to its 2016 predecessor, a sudden glimmer of hope for the losers half-way through the singles being quickly extinguished and everything petering out as players down the order went through the motions. It ended not with a bang but with a whimper. Things were not always thus. Between 1987 and 1999 the competition was reliably exhilarating. It produced four single-point victories, a draw and a pair of two-point wins. This millennium has been much less exciting, with six of the last eight contests woefully one-sided. The last time the Americans won on European soil, Jon Rahm hadn't been born, Bryson DeChambeau was ten days old and neither Justin Thomas or Justin Spieth had taken their first steps. The latest damp squib denouement left plenty of time to wonder about the point of the Ryder Cup. Genuinely great sporting events furnish us with significant information about the state of the game and the qualities of those involved. Competitors have something important to prove. But what does the Ryder Cup prove? That Europe has better golfers than the US? Hardly when this year Americans won three out of four Majors, all four FedEx Cup play-off events, the Players Championship and the three World Golf Classic events played so far. These were the tournaments that mattered in what has been a great year for golf. The Ryder Cup pales into insignificance by comparison. Sergio Garcia may have become Ryder Cup record points scorer but this achievement means much less in the grand scheme of things than the Masters he won last year. Any competition where Ian Poulter is an all-time great and Tiger Woods a serial failure is hardly a true test of merit. Claiming Poulter's defeat of Dustin Johnson makes him in some way a better player than the world No 1 is like suggesting Andrej Kramaric of Hoffenheim is a superior footballer to Christian Eriksen because the former scored in the Denmark-Croatia world cup penalty shoot-out and the Spurs star didn't. The Ryder Cup is a bit like a penalty shoot-out or cricket's T20 format, an attenuated and slightly unreal version of a great game which is especially attractive to those without the patience for the subtleties of the real thing. Each European victory is greeted by klaxons of triumphalist chauvinism. This seems like the oddest form of jingoism in the world, belligerently celebrating an otherwise non-existent sporting entity. The eagerness with which the continental cause is biennially embraced probably has more to do with bandwagons than Brussels. The unedifying spectacle of American players being booed and barracked cast an ironic light on the pearl-clutching European reaction when faced with similar partisan behaviour Stateside. Old Tom Morris must have been turning in his beard. The louder members of Tommy Bjorn's barmy army sounded like lads who'd take Alan Partidge's advice and get decked out in Strolling Pastel for the trip to Paris. The Yanks don't complain about crowd carry-on quite as much as we do when the boot is on the other foot. Perhaps that's because the Ryder Cup seems to mean infinitely more to Europe. This continent has a tradition of high-profile international competition. 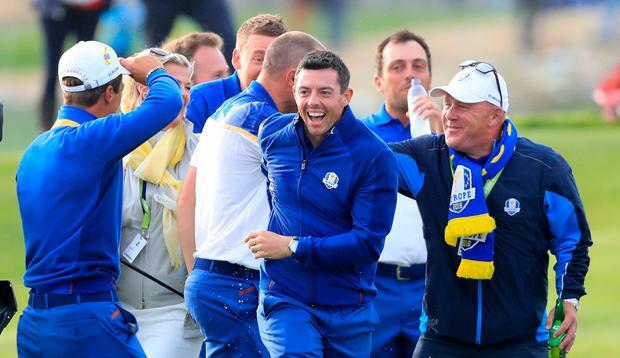 Every European golfer knows what it's like to support a national soccer or rugby team. Americans grow up following sports where the big competitions take place at home. They don't seem to really buy into either the flag-waving or the idea of golf as a team game. European zeal may also be stoked by the fact that the USPGA tour is still where the real action is. The Ryder Cup is a consolation prize. Long before the final ball was struck you sensed American thoughts were turning to future individual challenges. The WGC Champions event taking place later this month will offer a more telling illustration of status within the game. Sky informed us yesterday that while these players often play for millions, this week something priceless was at stake. Priceless? Or worthless? When Tiger Woods retires, his Ryder Cup misadventures will not be viewed as subtracting one iota from the sum of his greatness. What does that tell you? The patriotic drum was nevertheless beaten relentlessly by the host broadcaster in a manner which recalled fiercely one-sided GAA club match videos or those cringey, "Come on Steve, come on Paula," BBC Olympic commentaries. Normal balanced coverage was replaced by a 'backing our boys' approach. Paul McGinley may not be the worst analyst in the world but he enjoyed some extraordinary cheerleading during his stint in the commentary box. He was not alone. Silliest of all was the insistence yet again that the captain of the winning team, Thomas Bjorn in this instance, plays the same kind of key role as a football manager. In truth, with Europe amassing seven victories out of nine since the switch to even numbered years, most of us could probably pick a winning team. The build-up to 2020 begins today. Don't believe the hype. It may have plenty of swing but the Ryder Cup don't mean a thing.